1954 - Monsignor Arthur Slade and The Sisters of Notre Dame de Namur open Holy Trinity Catholic School. Opening day saw a student enrollment of 504 and a staff of six Sisters of Notre Dame de Namur assisted by three lay teachers. St. Julie Billiart, Foundress of the S.N.D. de Namur order, believed in ‘the expectation of excellence.’ Nuns of this order believe that the highest levels of math, science, and every other subject area can be learned by students who are taught with tenderness and attention, a tradition which continues to this day at Slade. 1974 - Renamed the Arthur Slade Regional School by Lawrence Cardinal Shehan at dedicatory ceremonies on February 24, 1974, the school continues its fine tradition of providing a religious-oriented education for Kindergarten and grades 1 through 8 in the primary, intermediate and middle school levels. 1975 - Monsignor Slade EduCare Center is licensed by the Maryland State Department of Education, Division of Early Childhood Education. Slade is a leader in the area of early childhood care and continues to be highly regarded to this day. 1991 - In 1991 the center was the recipient of the first “Governor's Salute to Excellence Award” for its school-age program. 1994 - Expansion of the Edu-Care center brings the addition of a part-time PreSchool program for children ages 2-4. 2004 - 2004 marks the 50th Anniversary of Arthur Slade Catholic School. In honor of this Anniversary, a major capital campaign financed by the extensive school community helps realize renovation of the school auditorium. 2004 - In celebration of the 50th Anniversary, the school is re-named Monsignor Slade Catholic School. Monsignor Slade’s vision of the necessity of Catholic education for the children of his parish was a compelling force motivating his life, and we continue to honor his priestly ministry today. 2016 - More than 4,000 students have walked the halls of Monsignor Slade Catholic School for over 60 years. 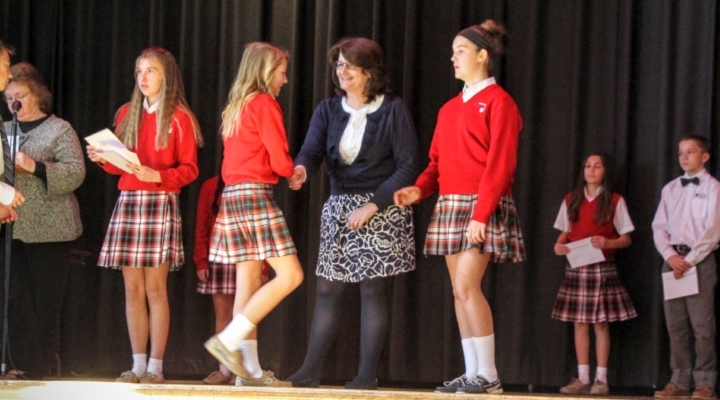 Monsignor Slade Catholic School continues to uphold St. Julie Billiart’s ‘expectation of academic excellence,’ educating over 600 students from PreK 2’s through 8th grade. Faith, knowledge and service are the hallmarks of a Slade education, along with outstanding preparation for high school and college.